Nanditha Dissanayake, Matthew Eisaman, Yutong Pang, and Ahsan Ashraf display the setup used to track the flow of electrons through the photoactive layer of organic solar cells. The red and black wires in the box in the foreground (also shown in close-up) are connected to a solar cell that is in contact with a prism. The prism guides laser light through the cell in a range of specific directions to gain precise information about how electrons flow. (Phys.org) —Sunlight absorbed by organic solar cells must first navigate a nanoscale gauntlet before becoming useable electricity. After hitting the light-absorbing material of the solar cell, called the photoactive layer, absorbed sunlight excites electrons, freeing them to find their way through a maze filled with twists, turns, dead-ends, and collisions. Only the free charges that successfully make it through this maze can be used in a circuit as electricity. So scientists have been looking for ways to ease the electron traffic jam in organic photovoltaics. Now, researchers at the U.S. Department of Energy's (DOE) Brookhaven National Laboratory and Stony Brook University have developed a way to map out the degree of "traffic congestion" on the electron highways within the photoactive layer. Their new measurement and tracking technique uses optical-guided modes—a process of guiding light through precise areas in the horizontal plane of solar cells—to help scientists better understand how the materials used in the photoactive layers influence the speed and efficiency of electron travel. "With our technique, you can now better understand how far the electrons move through the complex network of the photoactive layer," said Brookhaven physicist Matthew Eisaman, team leader on the new study published online in Advanced Energy Materials on August 25, 2013. "Previous studies revealed the material composition, but our technique illuminates how that structure impacts electron transport." Unlike the large silicon-based solar cells you might typically see on household roofs or arrayed in large-scale installations to generate electricity, organic solar cells are more like flexible plastics. Organic cells could find widespread applications in portable power generation for commercial and military use or even in so-called "building-integrated photovoltaics," where solar cells are directly integrated into the windows, façade, or roof of a building. Their flexible forms can be made inexpensively using large-scale, roll-to-roll manufacturing. But for now these versatile materials are not as efficient as inorganic options. When light excites electrons in the photoactive layer of organic solar cells, the process creates a pair of charge carriers—an electron and a "hole," the absence of an electron where it once existed. To become free charges, the electron-hole pairs must be split apart, and this occurs at the interfaces of two materials that typically make up the photoactive layer, one being an electron acceptor and the other an electron donor. The most commonly used photoactive layers in organic solar cells are called bulk heterojunctions (BHJs), in which acceptor and donor materials are mixed. This allows for more effective light absorption and charge extraction because those critical interfaces are present throughout the cell. The electron acceptor and electron donor portions of the BHJ photoactive layer are like two different types of highway networks within the solar cell, Eisaman explained. Electrons travel along the electron acceptor highway system, which is made of fullerene molecules, while their corresponding holes move through the electron donor highway system, which is made of a semiconducting polymer. Understanding how electrons move through the BHJ photoactive layer has the potential to make organic solar cells more efficient than those currently available. To reveal the inner structures and interactions of these BHJ "highways," Brookhaven Lab scientists probed the solar cells with light from different directions. "Solar cells are like pancakes, flat with a big surface area," Eisaman said. "Sunlight typically hits the solar cell from the top side and passes through its thin layers. This is called normal incidence." Previously scientists would observe the photoactive layer by shining a laser through the top of the solar cell, similar to sunshine. But probing solar cells with normal incidence is an incomplete method—light shone from above will tend to have higher intensity at the top of the photoactive layer, decreasing as it gets absorbed through the material and limiting the resolution. The new method that Eisaman and his team developed sends light horizontally through the photovoltaic rather than just from the top. "Guided optical modes allow for better control of the position of the light," Eisaman said. "The light propagates within the plane of the pancake, providing more precise information." Fullerene and polymer materials do not uniformly mix throughout the BHJ photoactive layer. Instead, the materials tend to "phase segregate," with one side being polymer-rich and the other side being fullerene-rich. This phase segregation affects both the propagation of light and the passage of electrons and holes through the layer. Using their high-resolution picture of the BHJ photoactive layer, the scientists then mapped out how electrons travel through the solar cell. "The electrons and holes are like two different makes of cars that travel on two different types of highways," said Nanditha Dissanayake, lead author on the study. "We want to understand at what 'exit' each car first appears on the solar cell highway, and what happens as they travel to a city—or an electrical contact—where the highways end." The new method enabled Eisaman and his team to selectively excite regions within the BHJ photoactive layer so that they could measure, with unprecedented accuracy and simplicity, the distance the electrons travel. "With the normal incidence method, you're creating a lot of cars scattered somewhere between Exit 35 and 50," Eisaman said. "But with our guided-mode technique, we're able to effectively create cars at exactly Exit 60. So we can observe how many of them traveled safely from that exit to the end of the highway, clearly drawing the path and revealing the pot-holes, road-blocks and accidents." Added Dissanayake, "This technique gives you a fundamental understanding of how composition within a solar cell affects charge extraction and the efficiency of a device. 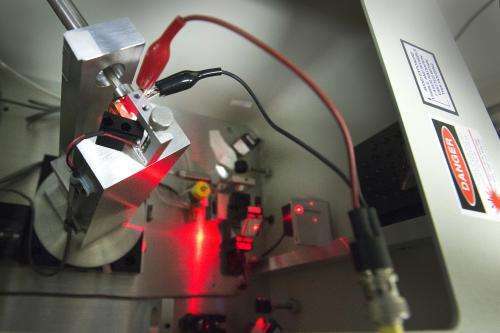 It gives people guidelines on how to formulate high efficiency solar cells—not limited to organic, but also other types of nanomaterial-based photovoltaics." 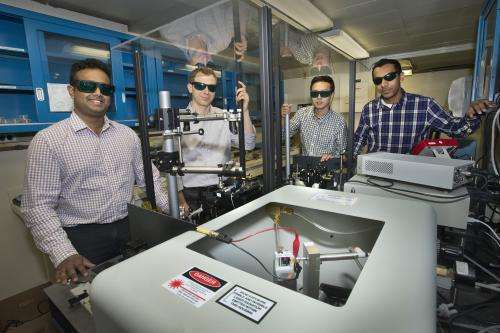 The researchers used instruments at the Lab's Center for Functional Nanomaterials (CFN) to fabricate the solar cells and characterize their material properties. They also performed precise measurements on phase segregation using Brookhaven's National Synchrotron Light Source (NSLS). "The complimentary capabilities of the new optoelectronic techniques being developed in our lab and the world-class fabrication and materials characterization facilities at CFN make Brookhaven a perfect place to do this work," Eisaman said. "This technique is core to our strategy for building new and unique capabilities for photovoltaic device characterization," said Patrick Looney, chair of the Sustainable Energy Technologies Department at Brookhaven Lab, where Eisaman works. The paper is titled "Mapping Spatially Resolved Charge Collection Probability within Bulk Heterojunction Photovoltaics."